The Econo Lodge Inn and Suites offers a number of ways to make your stay extra special – if you know about them! A pet friendly hotel, don’t be surprised if you see a few canine friends exploring during your stay – and if you do want to take your dog with you on holiday, contact the hotel before your arrival. 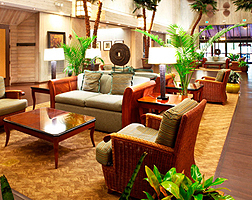 The lobby area offers free tea and coffee – perfect for when you first arrive and need a cup of tea during check-in! Block 1 of the hotel overlooks the reception area and is quieter in the evenings, while block 3 has views of the pool – if you have a preference in which block your room is in, let the staff know at check-in!